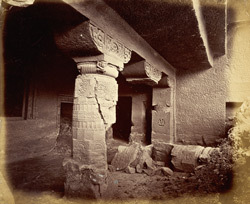 Photograph of the right side of the porch and entrance of the Buddhist Vihara, Cave XXIV at Ajanta, taken by Robert Gill around 1868-70, from the Archaeological Survey of India Collections. The Buddhist cave temples of Ajanta were first excavated into a cliff overlooking the Waghora River in the 2nd and 1st centuries BC. Cave 24 dates to the end of the 5th century, the monastery was planned on a large scale but was left unfinished. Most of the columns of the porch have fallen but their rich ornamentation can still be seen from the ruins. This view shows the shaft of the pillar carved with medallions with aquatic monsters or makaras with foliated tails, bands of ornate foliation and scrollwork and half lotus motifs. The capitals are carved with flying figures and amorous couples above compressed ribbed amalaka fruits with small figures of ghanas supporting the brackets.